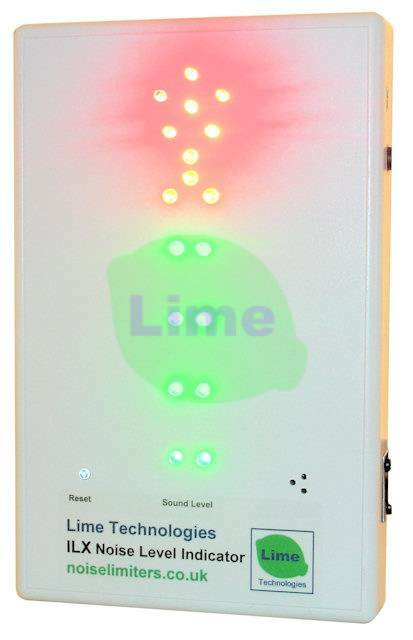 The Lime Technologies ILX Noise Level Warning Indicator was developed for venues where there may be a noise issue but the local authority have not required the installation of a noise limiter. Also suitable for health & safety use in industrial environments. The ILX indicates the sound level relative to your preselected maximum or reference level. The reference level can be set anywhere in the range 70-120 dB. Powered using a 24 Volt mains adaptor (supplied), the unit may be situated almost anywhere and can easily be wall mounted using the keyhole knockouts or double sided sticky pads. The optional high intensity warning beacon provides even greater visibility. Alternatively the beacon may be mounted at a separate location (eg. in a managers office) to deliver remote indication. The beacon can be set to flash either when the amber LEDs light or when the red LEDs light. A switchable delay setting can prevent nuisance triggering. Alternative External Microphone Version with separate microphone and cable may increase accuracy by monitoring the sound level at the exact location required. Note: A sound level meter will be required if you wish to set the unit to a specific sound pressure (dB) level - Click here for details. The ILX is ideal for use in schools and colleges to warn students and staff when noise levels are too high thus helping to ensure that the learning environment is effective and safe. Low cost alternative to Soundear, Soundsign or SafeEar with superior warning capability. The ILX is a traffic light style noise monitoring and warning unit also available precalibrated for industrial, hospital, office, hotel applications - please call for pricing.